Check out the Winter Haven Police Department on our March 2018 edition of the Heartland Crime Stoppers Show. Catch up on our 2017 Heartland Crime Stoppers Shows at https://youtu.be/Jy95NsyURdQ. See some of the people and agencies we interviewed on our monthly Crime Stoppers Show. Check out our Heartland Crime Stoppers Show ! We do a monthly Crime Stoppers Show where we profile our Law Enforcement Partners, their agency, and what they do. This month, we talk with Major Brandon Ball of the State Fire Marshall's Office. Winter Haven, FL - September 20, 2016 - Heartland Crime Stoppers is proud to announce that we have recently partnered with the Texas-based company, Anderson Software, to provide the tip management operating system for Heartland Crime Stoppers. Anderson Software leads the industry with its latest secure and anonymous tip acquisition and management solution, called P3 Intel. 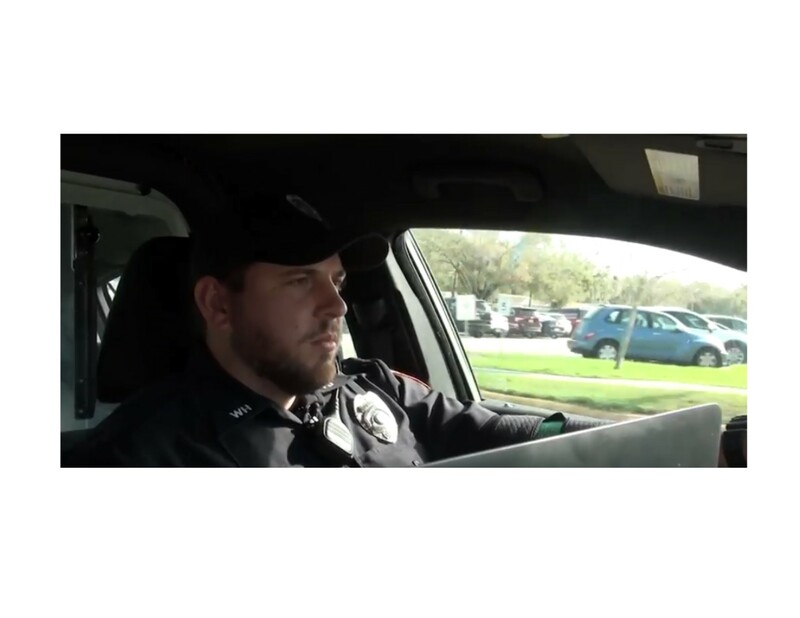 P3 Intel is currently the tip management system for Crime Stoppers of Tampa Bay, Pinellas Crime Stoppers, and Central Florida Crimeline (Orlando). 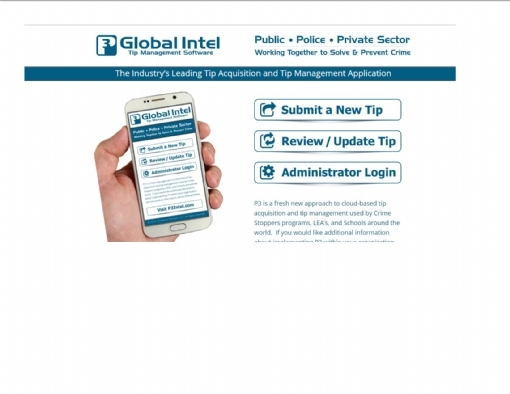 There are numerous other Crime Stoppers Programs throughout Florida and the United States that have upgraded their previous tip system to P3 Intel. Heartland Crime Stoppers has been using both P3Tips and TipSubmit dually for the last 30 days as information was migrated into the new P3Tips system. Tipsters have been able to submit anonymous tips to Heartland Crime Stoppers in either system during this time period. Effective Saturday, October 1, 2016, all web and mobile tips must be submitted to Heartland Crime Stoppers by way of P3Tips. Our toll free telephone tip line will continue to be 1-800-226-TIPS (8477). App: Download the free “P3tips” app to your IPhone, smartphone, or smart device. Heartland Crime Stoppers has been working with citizens, law enforcement, and the media since 1994 to help make our community safer by offering cash rewards of up to $3,000 for anonymous tips which result in an arrest, the recovery of stolen property, or the recovery of illegal drugs/narcotics. All tipsters will receive a confidential ID number and password. We will never ask your name or how you know the information. We do not have caller ID, use recorded phone lines, install tracking cookies, or copy your computer IP address. Tipster remain 100% anonymous. Crimes Stoppers: 40 years of Helping to Solve Crime! Crime Stoppers celebrates it's 40th anniversary this month! Thursday, September 8th is an important date to every local crime stoppers program across the country and in the U. S. Territories. It marks the 40th anniversary of the first Crime Stoppers case to be presented in the media. The Crime Stoppers concept started in Albuquerque, New Mexico. Someone robbed a Phillips 66 station in a well-traveled, well-lit area of town and shot a teen during the robbery. The incident took place on a Friday night. Police were left with no clues, even after weeks of investigation. No eye witnesses were able to give useful information. Any time there is a crime committed, someone knows what happened. Sometimes they just don't realize every detail they know until the incident is brought to mind. There were two likely reasons why no one was stepping forward. Either people who knew something and were afraid for their own physical safety from those involved, or they didn't care or didn't want to get involved. Albuquerque detective, Greg MacAleese decided there was a way to help overcome the problem of fear - if they were offered anonymity. He also added the incentive of a cash reward. Police could not offer rewards for anonymous information, so they needed a local community board that could raise the money and pay the rewards. The Albuquerque community stepped up. MacAleese needed a way to get his message out. He got help from the media in the form of the first Crime Stoppers reenactment of a crime. It was a detailed account of the crime and stressed the guarantee of anonymity and the cash reward of $1,000. A call received by the program resulted in the arrest of three men, within 72 hours, who had been involved in the homicide of the young college student that had occurred 4 months earlier. Word spread quickly regarding this incident and soon there were other U.S. programs. The umbrella organization, Crime Stoppers U.S.A. was formed to provide training in best practices to members of the local non-profit boards and to the law-enforcement coordinators that work them. Co-Founder of Crime Stoppers, retired judge, Richard Carter recently told a Law Enforcement Appreciation Night audience that the creation of Crime Stoppers ranks with some of the important innovations in crime fighting. It's as important as fingerprinting, car-to-car radios and DNA testing. He says it's that important and has stood the test of time. Today, community and student Crime Stoppers programs reach around the world and are represented by the United States, Canada, Caribbean and Latin America, Europe, Australia, and the South/Western Pacific. Crime Stoppers is a partnership between the Community, the Media and Law Enforcement. Each local crime stoppers program is its own 501c3 non-profit corporation, governed by a local board of directors operating under their own by-laws. Crime stoppers guarantee of anonymity is protected by statute by most states and has been tested at the Federal level all the way to the U.S. Supreme Court. Thanks to the members of every Crime Stoppers board for the last 40 years. Local Crime Stoppers programs are non-profit organizations led by citizens against crime. Some Crime Stoppers programs offer cash rewards of up to $3000 to persons providing anonymous information that leads to the felony arrest of criminals and fugitives. Information is received through anonymous Crime Stoppers tips that are received through a secure tips line or through a secure web connection manned by a professional program coordinator. Each caller is assigned a code number for the purpose of ensuring anonymity. The September 2016 regular scheduled meeting for Heartland Crime Stoppers will be moved to September 19, 2016. The Heartland Crime Stoppers Board of Directors Meeting will meet on Monday, May 18, 2015 at 5:15 pm. The meeting will be held at the Polk County Sheriff's Office Operation Center, 1891 Jim Keen Blvd, Winter Haven, FL. The Heartland Crime Stoppers Board of Directors has changed it's regular scheduled April 2014 meeting to Monday, April 20, 2014 at 5:15 PM. The meeting will be held at the Polk County Sheriff's Office Operations Center, located at 1891 Jim Keene Blvd, Winter Haven, FL 33880. Heartland Crime Stoppers approved rewards in December totaling $7,915.00. The rewards included cash for a homicide (Lakeland), auto theft (Winter Haven, were an 11 year was forced out of the parked vehicle), using a stolen credit card, trespassing, drugs, people with outstanding warrants, and thefts. All it takes is to leave an anonymous tip by phone, text, web, or the "TipSubmit" app on your smart phone. If your tip results in an arrest, the recovery of stolen property, or the recovery of illegal drugs, you are eligible for a CA$H reward of up to $3,000.00. Let's help make our neighborhoods a safer place to live, work, and play. Let's put criminals where they belong.....in jail and out of our neighborhoods! June 2013 Rewards total $14,630.00 ! ne Rewards total $14,630 !! 4- Seven cases reporting people with outstanding warrants, who were located and arrested on charges which included: Conspiracy to Commit Armed Robbery, Battery, Grand Theft, Dealing in Stolen Property, Petty Theft, Child Abuse, Failure to Register as a Sexual Offender, Violation of Probation, Drug Possession, and Failure to Pay Child Support. Do you have information on criminals or criminal activity? An anonymous call to Heartland Crime Stoppers 1-800-226-TIPS (8477) could result in you getting a cash reward, too. Your tip can be on ANY crime. It does NOT have to be one that is posted on our site ! You can also text a tip or use the web to submit anonymous tips. We don't record calls, use caller ID, or otherwise track where the tip came from. Did You Get Your Part of $3,310.00 ? $3,310.00 is the reward amount that was approved at the Heartland Crime Stoppers September 24, 2012 Monthly Board of Director's Meeting. Fourteen (14) people will recieve their portion of that money, which averages $236.43 per person. All they had to do was to contact Heartland Crime Stoppers with information they already had on someone involved in a criminal act. Some of the cases for which rewards were approved included Possession of Methamphetamine, two (2) cases of Retail Theft, fugitives with outstanding warrants, a stolen vehicle, and Possession of 5.5 pounds of Marijuana with Intent to Sell . Additionally, several rewards were approved as part of the Student Crime Stoppers Program. Those cases included students using marijuana and K-2 at a bus stop and on the school bus, another student for Possession of Marijuana with Intent to Sell, and another for theft of an Iphone. Our thanks to the people who took a stand against crime ! The scheduled August 27, 20122 Board of Directors Meeting was been re-scheduled for Tuesday, September 4, 2012 at 5:15 pm. This change is due to the approach of Tropical Strom Issac, which is expected to impact Polk, Highlands, and Hardee Counties on Monday, August 27th. The re-scheduled meeting will be held on September 4th, at the Polk County Sheriff's Office Southwest Command, 4120 US 98 South Lakeland. June Rewards total $7,175.00 ! Heartland Crime Stoppers Approve $7,175.00 in Rewards for June 2012. 3- $435.00 to a Tipster who reported that Daniel White was involved in Identity Theft and filing false tax returns. This information was forwarded to the Florida Department of Law Enforcement. An investigation by FDLE resulted in the arrest of Daniel White on 39 counts of Filing False Claims, 1 count of Aggravated Identity Theft, and 1 count of Wire Fraud. 4- $390.00 to a Tipster who reported a subject selling methamphetamines from the suspect’s job. An investigation by the Polk County Sheriff’s Office resulted in the arrest of Shawn Williams on charges of Possession of a Controlled Substance Without a Prescription, Possession of Methamphetamine, and Possession of Drug Paraphernalia. Heartland Crime Stoppers would like to thank all the concerned citizens who share information on crimes and criminals with us. It is with their assistance, that criminals are being held accountable for their crimes and dangerous felons are being removed from our neighborhoods. Heartland Crime Stoppers has changed it's meeting date for May to Monday, May 21, 2012. The meeting begins at 5: 15 PM and will be held at the Polk County Sheriffs Office Southwest District Command, 4120 US 98 South, Lakeland, Fl. The reason for the change is due to the normal meeting date of the Fourth (4th) Monday of each month, falls on Memorial Day (28th) for May 2012. New Address and Phone Numbers !! A Special Meeting of the Board of Directors has been called for Monday, March 12, 2012. The meeting will start at 5:15 pm at the Polk County Sheriff's Office Southwest Command Office, located at 4120 US 98 South, Lakeland, Florida. The purpose of this meeting is to review and vote on recent changes to the Heartland Crime Stoppers By-Laws and Standard Operating Procedures (SOP). The Heartland Crime Stoppers Board of Directors approved rewards totaling $2,720.00 at their monthly meeting on February 27, 2012. The rewards went to 16 individuals, with the average reward being $232.50. Moonshine: 1 Recovered was 13 gallons of moonshine. A tip to Heartland Crime Stoppers on narcotic activity resulted in the arrest of Michael Serante for possession of cocaine, possesion of drug parapharnalia, and possession of cannibis. This tipster received a reward of $390.00.